Conditions towards the east on LF as well as on the broadcast band (BCB) have taken a positive leap forward over the past few days. Last night, 160m was open to Europe from here, the first opening of the season as far as I am aware. 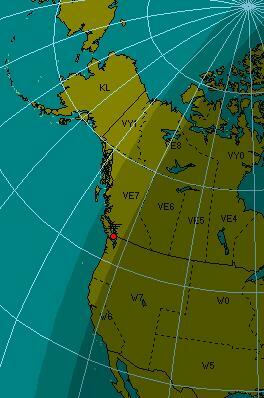 I also spent some time listening to a dozen or more TA (Trans-Atlantic) carriers on the broadcast band, signalling good conditions over the pole finally.The polar skip also extended down into the LF band, as it did the previous night. In the afternoon hours I started watching for Europe1 on 183kHz, transmitting from western Germany, and was able to see its weak carrier on the Perseus SDR's waterfall display several hours before sunset. Twilight here brought a dramatic improvement in signal strength as shown below. As daylight approached the transmitter site in Germany, the 183kHz signal provided a good visual example of 'dawn-enhancement', with the signal showing a dramatic flare on the waterfall indicating its build-up in strength. Once dawn arrived, it was interesting to see that the signal was able to hang-on for over an hour with reasonable strength before fading out rather quickly. 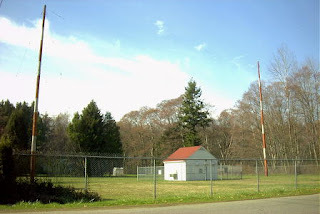 Even though the transmitter site was in full daylight, the dark skies to the west were able to sustain propagation for some time before it all came crashing down. Of late, the pre-dawn hours here have also been providing some exceptionally strong signals from Asia on the BCB. These are often enhanced at sunrise as well, as the strength often takes a short fast peak, before fading out for the day. This was heard on the Perseus SDR and inverted-L antenna. The LF polar signals shown above, were recorded with the 10' X 20' loop and Wellbrook preamp while looping towards Europe at 030 degrees. With the DST going positive, hopefully these good conditions will continue to build over the next few weeks. October is often one of the best months of the year for LF/MF DX. 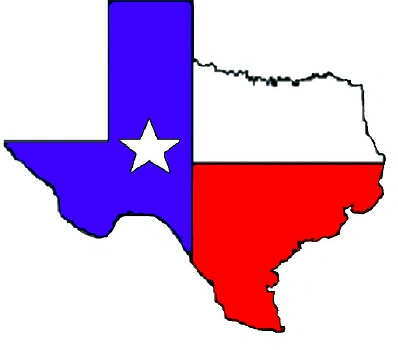 I spent a few hours, yesterday and today, playing in the Texas QSO Party. 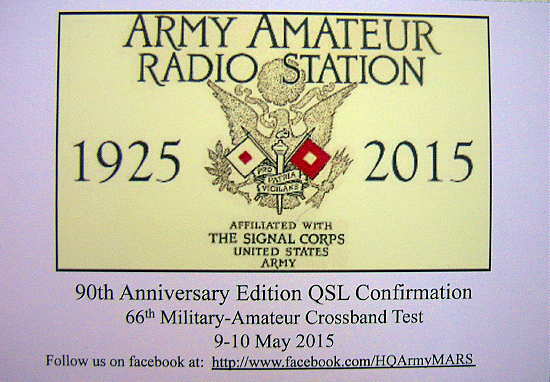 As annual QSO Parties go, this one must be one of the best. With Texas being such a large state, there seemed to be a correspondingly large amount of activity. As well, Texas is a nice single-hop from here on HF and most signals, even from the numerous mobiles, were loud. I entered in the low-power, single- operator, CW-only class and without spending huge amounts of time, ended up with 185 contacts in 117 counties. There was a very active fleet of mobile operators as well, moving from county to county and sometimes setting-up on county borderlines to provide two, three or even four counties at a time. Thanks to the dedicated mobilers ... you fellows really add a lot of interest to the contest. Mobile stations also provide extra 'bonus' points, with 500 additional points gained each time you work the same mobile in 5 different counties. Two of them were worked in more than 15 counties, while five were worked in 10 counties. Two were worked in 9 counties, missing the extra thousand points by one more from each. My weekly QSO Part activity has been a good way for me to ease back into contesting and an aid in improving my ear-brain-keyboarding skills ... it's been helping a lot. One area that doesn't get a lot of practice is in the 'run' mode, since most of these QSO party contacts are in the 'search and pounce' (S&P) mode. Hopefully something will come up soon where I can get more 'run' practice as this requires a higher level of alertness compared with S&P. In reality, either mode is a great way to keep your CW skills honed. The old laptop, running Windows XP, continues to work well as does the N1MM logging software driven by the K1EL USB keying interface. Further scrubbing of the laptop's unneeded files and start-up programs has sped boot-time to about 90 seconds. Quite an improvement over the eight minutes it was taking before tackling the cleanup! If you are interested in getting started in contest work, or getting back into it, the WA7BNM Contest Calendar is probably the best source of information ... descriptions of all of the major contests (and some not so major), as well as links to contest-sponsor pages, may be found there. As well, the same site provides the '3830' board, a place where contesters can share their claimed score totals and discuss the event immediately following a contest. It's always fun to see how you compare with other submissions in the same category. 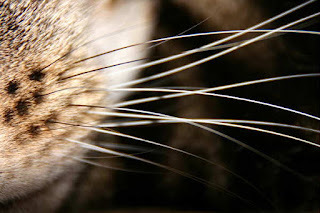 I've just recently read of a phenomenon that I had never heard of before this week ... "Tin Whiskers". 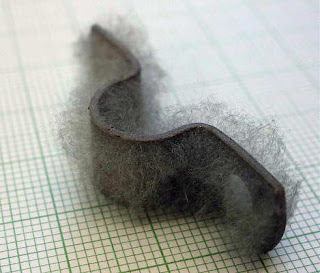 Tin whiskers are hairlike crystalline structures that can grow from tin surfaces and have the potential to wreak havoc on modern electronics. Ever since the European RoHS (Restriction of Hazardous Materials) implementation, most manufacturers have been forced to switch to lead-free solder. It seems that lead, when combined with tin, inhibits the growth of tin crystals. Although tin whiskers have been around for many years, it is just since the switch to lead-free solder that their impact on circuit boards (particularly with SMD sizes) has been garnering a lot of attention. Even the military, which has always demanded a higher standard for its components and circuit fabrication, is worried. With almost everything, from alarm clocks to aircraft, reliant on electronic circuit boards, are we awash in a sea of electronic ticking time-bombs? Some experts believe that we are. The whiskers themselves can grow from a few millimeters to over 10mm in length. Growth rates as much as 9mm per year have been observed. One might think that these tiny hairlike structures would not be capable of carrying sufficient current to cause damage and would act more like a fuse when shorting with a nearby pc trace or component lead but such is not always the case. Tin whiskers have been known to carry as much as 30ma of current ... more than enough to cause catastrophic failure in delicate circuitry ... not a pleasant scenario if you are cruising along at 36,000' in a 10-year old aircraft. It’s rational to ask, after a few years of RoHS policy in force, does this effect ever really cause any problems? As it happens, yes, and some examples are so spectacular that it’s amazing they have not reversed the policy for RoHS. In Europe, the most impressive example was $1 billion recall of Swatch watches from Switzerland, as the use of lead-free solder caused a roughly 5 percent watch failure rate in 2006. The “solution” to this problem was yet another rule exemption, and lead was again used in Swatch construction. A real RoHS policy triumph there. Reports indicate that six satellites sustained partial or complete loss due to tin whiskers. These involved Galaxy-3, Solidaridad 1, Direct TV3, and HS 601 satellites built between 1998 and 2002. Problems also have been reported with the F-15 jet fighter radar, the Patriot missile, and the Airborne Warning and Control System (AWACS) aircraft. Perhaps manufacturers haven't developed an "experience base", or perhaps it isn't registering as a problem. Many customers will probably chalk failed devices off to their own isolated tough luck, when the cause might really have been microscopic whiskers inside their machines. Overall, was it sensible to go lead-free? "I would say no," ... Earlier obsolescence means more discarded devices. Critics argue that substitutes are more toxic and energy-wasteful than the lead they replace - and that lead doesn't leach from circuit boards, because it doesn't migrate as lead in paint or petrol does. This is clearly a problem that has to be addressed for the avionics industry sooner rather than later. Either a clearly worded exemption from lead use is required, or the frankly ineffective removal of lead from electronic assembly construction rule should be abandoned. This misguided policy has introduced a random failure mode into every item now being made under these standards or with RoHS compliant parts, a simply unacceptable risk for all involved. Plus, the ridiculously small (2 percent) targeted lead-use area fails utterly and completely to address the very real concerns of lead toxicity in the environment. Clearly, all of these issues are something worth thinking about, and their impact on our industry and all of us is significant if no useful action is taken. Although this is all new to me personally, perhaps this is old-hat by now, since the problem has been around for the past few years. Maybe a viable solution has been found already or will we see the introduction of lead into solder once again? I also wonder about the millions of life-critical circuit boards already in place that are, at this moment, quietly growing 'tin whiskers'. Over the past few days I've been trying to figure out some possible pathways that might be covered when transmitting from home. The only real directions that I can go any distances are towards the southwest and to the southeast because of two large hills (500' and 900') to the south. The challenge will be to put a signal over this 500' hill, about 1.5 km to the south ... I'll need to go around it on either side or over the top. Going around it at its edges will allow me to keep the light beam on a fairly low angle. The main obstacle is my lot ... it is heavily treed in these directions and aiming would have to be too high of an angle to get over the trees. I do however, have one small gap between the trees which has turned out to be close to the right bearing (220 degrees) for the southwest test. For this, I can set the transmitter on my back sundeck and shoot through the gap without bothering anyone. For the southeast shot, or one over the top,of the hill, I'll need to move the transmitter two lots to the east of me, and use the neighbour's clear view of the hill. This should work out OK, as the neighbour spends the winter in Boston and the house is vacant ... but the outside power sockets are alive. This path though, has me shooting across a small bay and above several houses. Most are summer residents only but there are a couple that are permanent. I'll need to contact them and give them a 'heads-up' before I run any tests, so they don't call the RCMP! 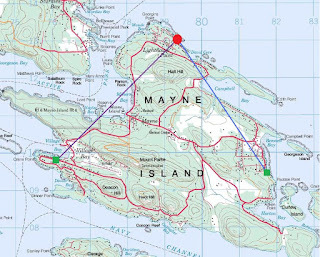 The June 2014 edition of Radcom has an inspiring article by G3XBM, "Over The Horizon At 481THz", where Roger describes his early clear air scatter tests and excellent results over an 8.5 km path. 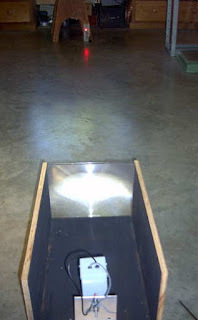 This is a very impressive distance considering the small LED transmitter and 4" magnifying-glass lenses used. Unfortunately, the distances here, on both paths, are not very much ... about 5 km. 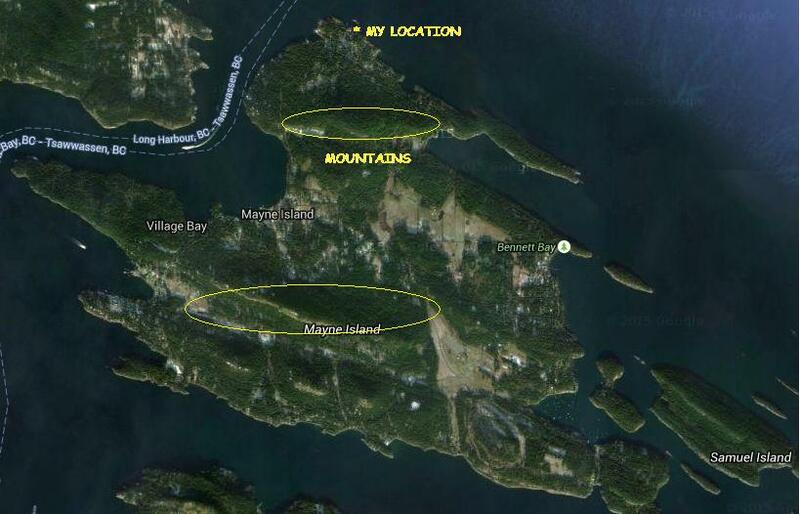 I'm fairly limited to how far I can go here on the island. I'd be very happy to cover this comparatively short distance and a lot will depend on being able to keep a low enough angle and still get over the hill. With the right weather, I may start as one reader has suggested, with a short almost vertical incidence shot and set up a few blocks away to test out the system. 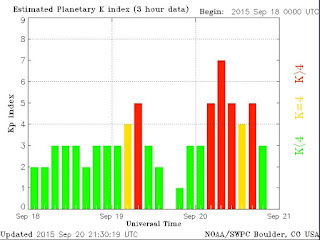 As is usually the case on CLE weekends, the propagation gods seem to ensure that the monthly activity never escapes a solar flare or CME event. Saturday evening, just as propagation was starting to look really nice, a fast-moving CME arrived one day earlier than expected, pretty much shutting down propagation for the night. With Friday night being very poor as well, it was hoped that Sunday night would see a return to better conditions. Unfortunately, Sunday was very noisy with heavy lightning crashes, although overall propagation seemed improved. Sunday night provided one new catch, VVV-332 kHz, not heard here before. For those looking to log Hawaii on the NDB band, 'POA' on 332 kHz is a good bet as it had a strong signal here on all three nights and was heard shortly after sunset in Hawaii. As usual, all stations were heard using the Perseus SDR. Hopefully CLE 199 will see the return of quieter band conditions and better propagation ... if the sun can calm down long enough. I recently had an inquiry about using 'MS Paint' for drawing PC board layouts. Although there are several freeware programs available for designing and drawing PC layouts, the ones I have tried had onerous learning curves. I also found that unless I was designing boards fairly regularly, I would have to go back and re-learn many of the functions each time I used the program. If you are regularly making a lot of boards, then these programs are certainly the way to go as they are packed with every feature you might need. On the other hand, MS Paint meets all of my requirements and is simple to use ... I like simple. Although some might turn up their noses at MS Paint, I have found it to be a powerful and underestimated software tool. Here are some of the things that you might want to remember if drawing a PC layout with 'Paint'. 1. Take the time to read the built-in HELP and USING files. It doesn't take long to learn all of the functions along with some of the shortcuts. 2. Always draw with the IMAGE ... DRAW OPAQUE function turned off (unchecked). Do this first. This way, lines can go as close as you want without any blocking or overlapping. Try it the other way and you can see what happens. 3. If you are working with IC's, take the time to make a 'master' pattern that can be saved and copied anytime that you need it. A 16-pin layout can by used for 14 and 8 pin IC's by copying and pasting it and then erasing the unwanted pins. I can send you one via email if you contact me. 4. Similarly, once you have established the correct pad spacing for certain capacitors or resistor sizes, copy and save them for future use. Finding the correct spacing will require a few trial printouts so you can measure the exact gap. 5. For detailed work, use the VIEW ... ZOOM...CUSTOM function to magnify the layout. This also allows you to use a grid if you find this helpful. 6. Never SAVE your layout while in ZOOM mode as you can't go back to the original size when you re-load your plan. I learned this the hard way. 7. For drawing perfectly straight lines, squares or round circles, hold the SHIFT key down when drawing the element. 8. For large areas of copper (groundplanes), outline the area then choose the FILL symbol to create the area. 9. With a little planning, you can almost always avoid jumpers to make a crossover connection, unless your circuit is very complex. 10. When you make a mistake, just use the EDIT ...UNDO command. You can go back several steps with this helpful function. 11. I will often draw a thin line between to pads to see if they are on the same level ... and then UNDO the line once I have checked. 12. Always SAVE your layout as a Monochrome Bitmap with the FILE ... SAVE AS function. Using some of the other modes will create less than solid blacks and some random pixels that can lead to etching problems. 13. If using the 'toner iron-on' method of etching, set your printer options to the highest resolution (mine is 1200 dpi) and then choose the darkest 'print' option. You want as much toner thickness as possible. Note that this method works only with laser / toner printers and not the ink-jet / bubble types. 14. 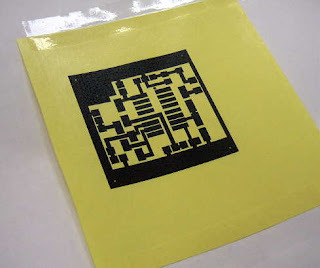 For the iron-on transfer paper, I have had good success with the shiny yellow transfer paper widely available on E-Bay, usually with free shipping. I get the best results when pre-heating the PCB in the toaster oven before ironing-on the pattern ... not too hot to touch however. If you just build the occasional PC board, you might find using MS Paint worthy of a try. It has been meeting my needs for many many years and once you have done a few, unlike some PC software, it doesn't take long to build a new board without having to learn how to use it all over again. On Tuesday, I completed the plywood enclosure for the new portable lightwave receiver and mounted the optics and the electronics. My plan is to use this here on the island for some clear-air scatter / cloudbounce tests, once suitable listening locations are determined. As with my main system, I used a homebrew mount capable of movement in three directions. 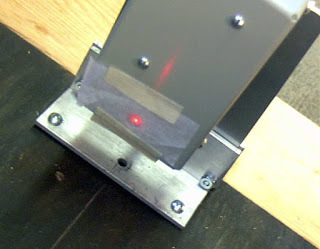 The photodiode needs to be mounted precisely at the focal point of the fresnel lens, and all three directions need to be juggled for correct alignment. Shown below is the setup used on the shop floor for alignment. The signal source is a 1W red LED about ten feet away. I covered the photodiode with a small piece of paper which made it a lot easier to find the point of sharpest focus. Once this had been found, everything was tightened and, hopefully, locked into position. I then constructed a simple mount which allows the receiver to be tilted in altitude so it can be set to point at the desired region of sky. Once this was done, there was nothing else I could do but wait for darkness, so that the receiver could be tested. 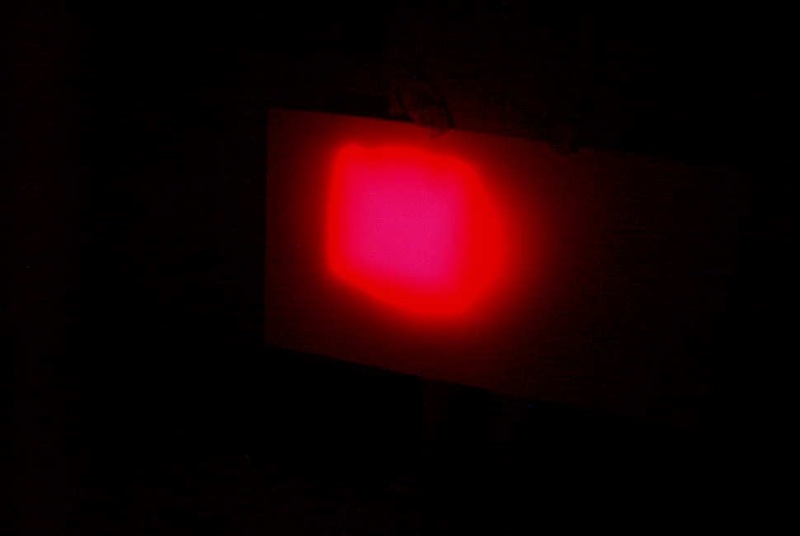 The fresnel lens used was purchased locally for just $5, so I had my suspicions regarding its optical quality. 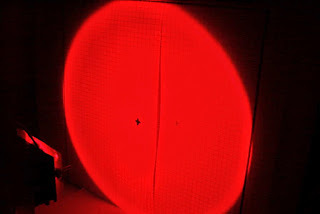 As well, it is 20% smaller than the bigger lens used in the main lightwave system. The bigger lens is 650 sq.cm compared to the inexpensive 'page-reader' lens of 530 sq.cm. 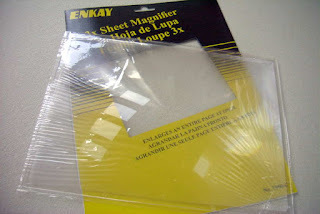 The 2mm thick rigid plastic lens is an 'Enkay 2950-C'. The larger lens has a focal length of 20cm while the page reader has a focal length of 45cm. This gives them 'f' numbers of .78 and 1.6 respectively. Once it was dark enough, I took the receiver to the ocean side of the house and sat down with the receiver. From here I have a clear view of the mainland coast, on the other side of Strait of Georgia. 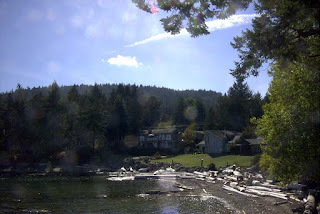 The nearest point of land on the other side of the Strait is about 20km. Much to my delight, the new lens / receiver appeared to work just as well as the bigger more expensive fresnel. As I swept the receiver across the far coast, I heard about twenty different signal sources. As usual, the strobe lights on aircraft were plentiful and very loud as planes lined up to the far north to land on runway 08 at Vancouver International. These signals were about 55km away. Several planes were followed as the climbed out into the clouds further to the east over Surrey. As I lost them visually in the clouds, the strobe signals were still quite strong in the receiver. 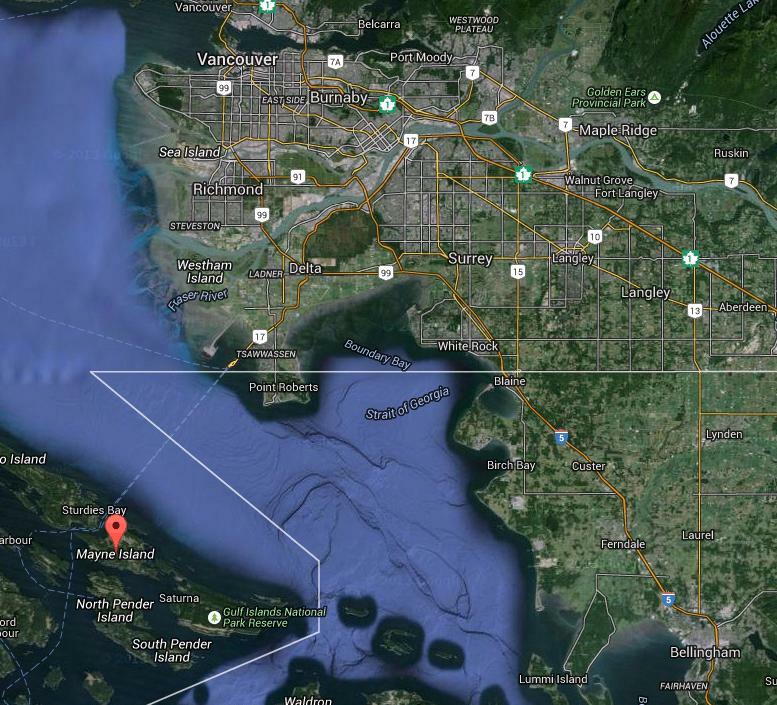 Several signals were heard coming from Washington state, including a particularly strong 'growler', repeating about every two seconds, coming from Cherry Point south of Bellingham, about 80km away. 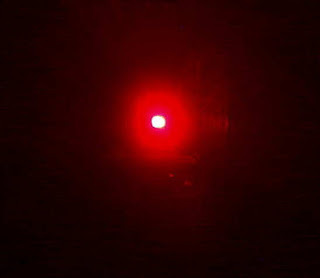 There were many signals that had no apparent visual source (to my eyes) but were easily heard in the receiver. It appears that the $5 lens is a real bargain and should work well for my scatter tests. It seemed also, that the smaller lens, having a higher 'f' number, has a narrower field of view as aiming was a little sharper than with the bigger lens. To hear similar signals, recorded on my first receiver, go to the links at the bottom of this blog from 2014/08. 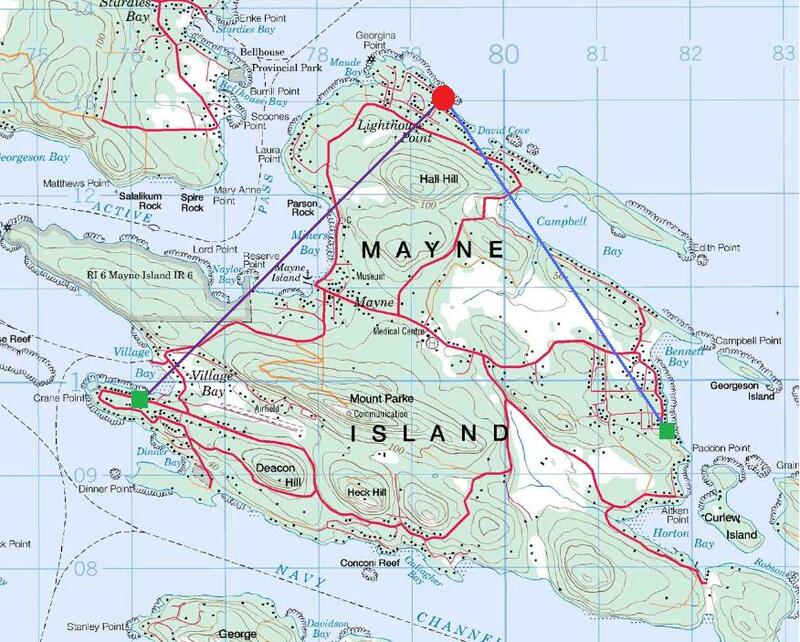 The next task will be to determine suitable listening locations here on the island. Unfortunately, the island is dominated with two high (600'+) peaks, one right behind me to the south, which will make it challenging to get a signal from one side to the other. Hopefully I can find a clear spot somewhere that will allow me to shoot a signal over the top ... and of course, the fall weather must co-operate. 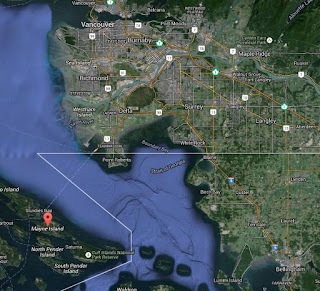 'WC' - 332 kHz White Rock, B.C. It's time for another CLE (Co-ordinated Listening Event) once again! For you low-frequency buffs, another challenge awaits. This month's activity covers the range of 320-334.9kHz and has plenty of targets for both North American and European beacon-hunters. A list of all of the North American targets in this range can be found in the RNA database, while targets for European DXers will be found here ... specify the frequency range wanted and check 'show all results'. An excellent target for this CLE is 'WC' (332kHz) shown here. Its 25W signal gets out very well and has been heard as far as Texas. It is unusually-located in the middle of a quiet residential street, nestled between homes on each side. not in an attachment, with CLE198 at the start of its title. # The Date (or day 'dd') and UTC (the day changes at 00:00 UTC). # kHz - the beacon's nominal published frequency (if you know it). such as Location, Offsets, Distance, etc. of your receiver, aerial(s) and any recording equipment that you used. that have been made for the event from REU/RNA/RWW. Yesterday, between dabbling in the Arkansas State QSO Party on CW, I manufactured and assembled the PCB for the new 'portable' lightwave receiver. 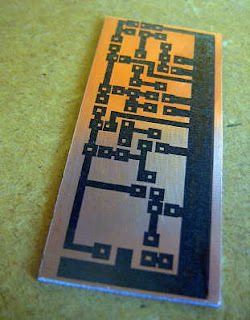 When building PCBs, I use the printer-toner method, after drawing the design with MS Paint. Compared to some of the freeware PCB design software now available it is fairly crude, but it more than meets my needs and could even work for designing SMD boards if needed. I've also made the switch from using the messy and corrosive Ferric Chloride etchant to a weak solution of Hydrogen Peroxide and Muriatic acid. The latter seems so much cleaner, faster and overall produces a better-etched board. 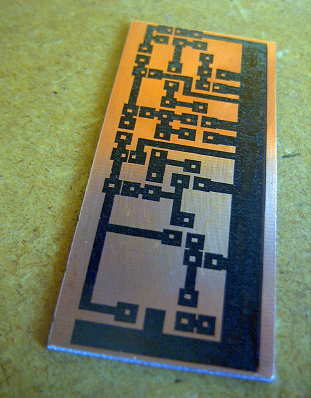 Boards can be completely etched in around three minutes, compared to the much longer Ferric Chloride. 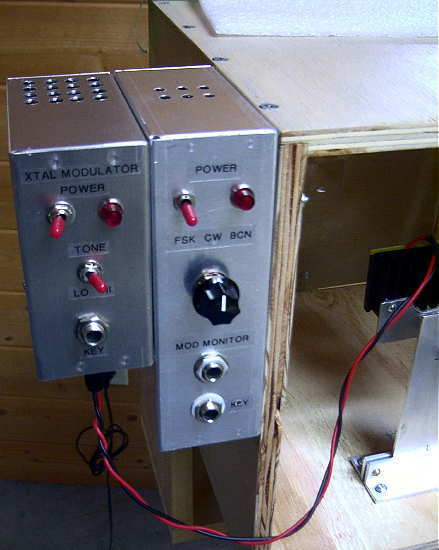 I chose to use the same receiver circuit as the one in my main system, garnered from the design shown in Roger's, (G3XBM) blog. If you have an interest in getting started in lightwave experimenting, you will find Roger's blog of his lightwave adventures to be both informative and inspiring. As before, I made a couple of minor changes to the receiver, substituting a BPW34 optical pin diode for the one shown as well as subbing a 2N5457 JFET for the MPF102. In addition, 2N5089s were substituted for the 2N3904s. 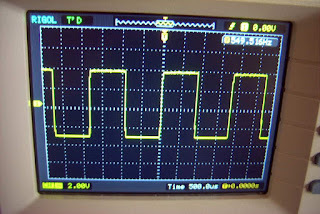 The newer JFET is lower in noise as are the higher gain 5089s. In all likelihood, the differences are only minor but I like to think that every little bit helps when all system-losses are considered. 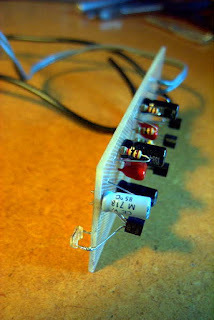 Note that it is important to make the connection between the diode and the JFET's gate lead 'floating' in the air as any contact with the PCB could introduce unwanted loses at this point. As in my original receiver, a locking split-shaft, removed from a junk box potentiometer, was mounted to the back side of receiver box. 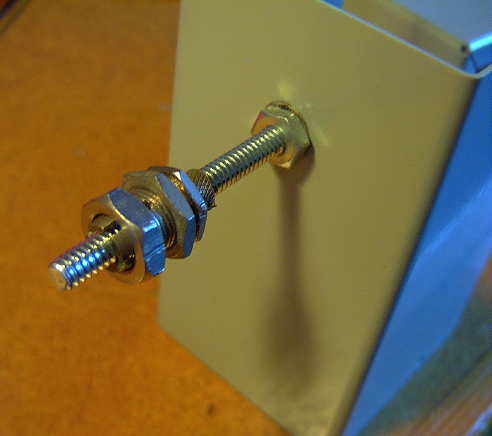 This will allow the receiver box and its pin-diode to be aligned forward and backward for focus and then locked. 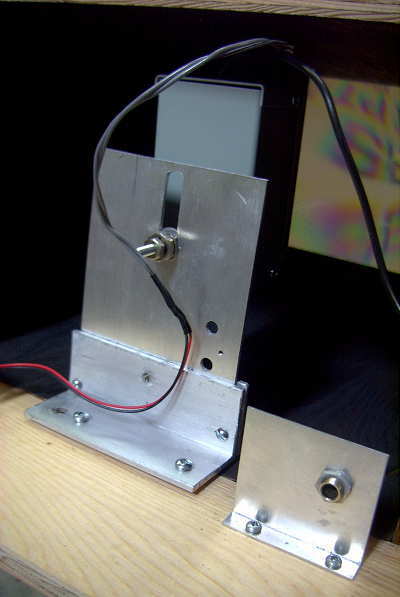 Once built, the focusing carriage will allow the receiver to move laterally, left to right as well as vertically, up and down. Positioning the optical diode at the exact focal point of the lens and maintaining this position is crucial. 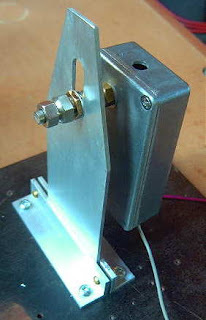 The finished carriage, will look similar to this one, used in my main system's receiver and transmitter box. So it's on to the plywood receiver box and then the focusing carriage. It will be interesting to see how my $5 fresnel lens page-reader, purchased from Princess Auto, compares with the slightly larger (and probably better) lens in the main system's receiver. 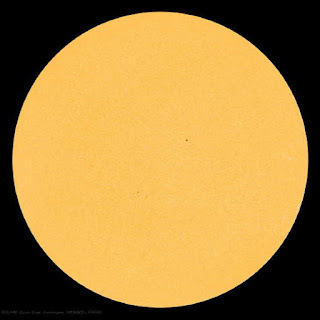 ... the sun has been deathly quiet, as can be seen in yesterday's solar disk image. It seems that just the 'normal' solar wind can disrupt things all on its own, without any solar flares or coronal mass ejections. In the late 70's, 'cracks' in the earth's magnetosphere were first observed... cracks that allowed even a quiet solar wind to actively interact with the earth's (normally protected) upper atmosphere. Apparently this is the present condition that has been disrupting normal propagation for the past many days. "Earth has a magnetic field, too. It forms a bubble around our planet called the magnetosphere, which deflects solar wind gusts. (Mars, which does not have a protective magnetosphere, has lost much of its atmosphere as a result of solar wind erosion.) Earth's magnetic field and the IMF come into contact at the magnetopause: a place where the magnetosphere meets the solar wind. Earth's magnetic field points north at the magnetopause. 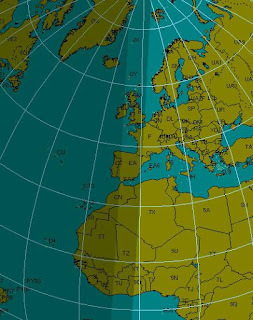 If the IMF points south -- a condition scientists call "southward Bz" -- then the IMF can partially cancel Earth's magnetic field at the point of contact. 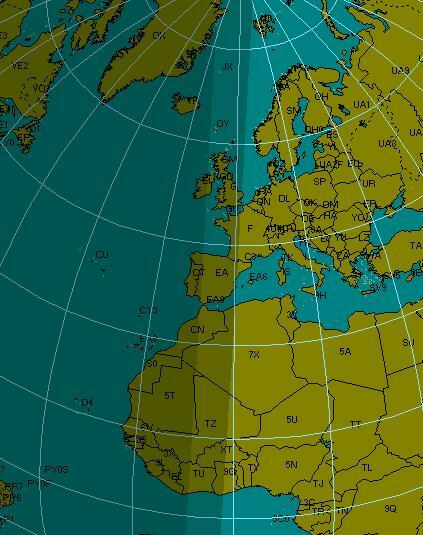 When Bz is south, that is, opposite Earth's magnetic field, the two fields link up," explains Christopher Russell, a Professor of Geophysics and Space Physics at UCLA. 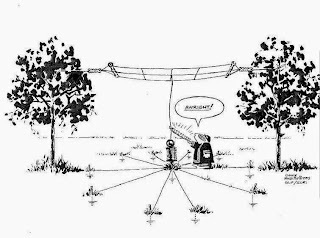 "You can then follow a field line from Earth directly into the solar wind" -- or from the solar wind to Earth. 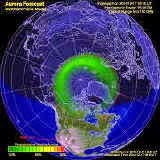 South-pointing Bz's open a door through which energy from the solar wind can reach Earth's atmosphere!" 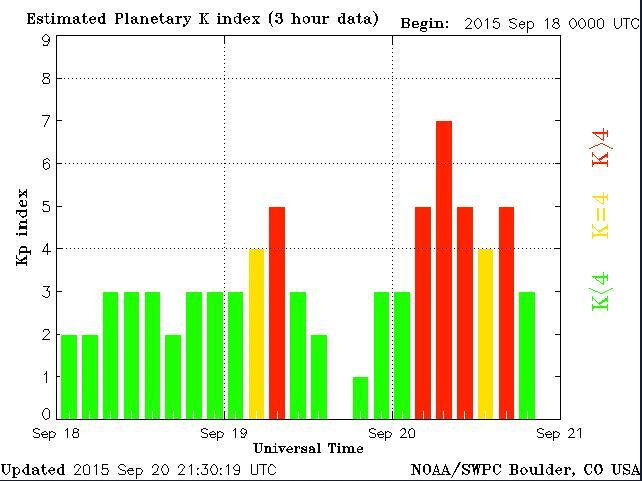 Earth's Bz has been pointing south during this entire period of poor propagation. Heavy ionization of the daylight D-layer, normally an 'absorber' of LF signals, has allowed reception of several NDB signals normally only heard at night. In fact, one of my favorite NDB propagation indicators, 25-watt YLJ in Meadow Lake, Saskatchewan, has been heard all day long on 406KHz for the past week as its signal skirts along the underside of the dense D-layer. These auroral conditions however, often enhance the path to the south Pacific and several western BCB DXers have reported excellent propagation to Australia and New Zealand in the pre-dawn hours. Another indicator of LF propagation disturbance is the DST or Disturbance Storm Time index. This number gives an indication of the severity of the weakness in the magnetosphere, with numbers going further and further negative as the charged particles trapped in the magnetosphere increase in numbers. The DST has been having a rough ride since the beginning of the month and as these numbers grow more positive and remain there, propagation will return to normal. With late September and October often being among the best months of the year for LF propagation, and with the sun now doing its part by remaining quiet, let's hope that the earth's magnetosphere will also co-operate and seal-up those propagation-killing cracks. Yesterday I completed the construction of the crystal-controlled tone generator which will be used to modulate my lightwave transmitter during future clear-air / cloudbounce tests. It was installed on the lightbox, right beside the original 556 CW beacon / tone generator. 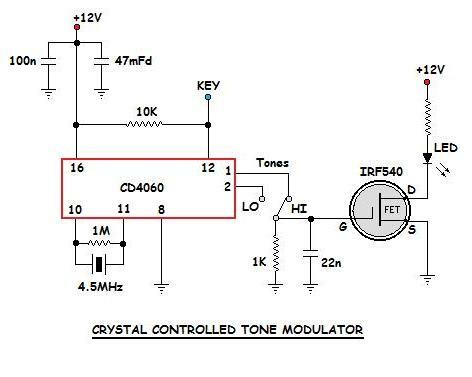 The crystal-controlled oscillator uses a CD4060 IC as an oscillator-divider and produces a ~550Hz or a ~1098Hz squarewave from the 4.5MHz crystal. The original 556 tone generator will be kept for aural CW and beacon modes as it provides a stable enough signal for this purpose but for the very narrow bandwidths that I plan to use when digging into the noise with Argo, I reasoned that the signal needed to be more stable. As can be seen by comparing the two oscillators (crystal on the left and 556 on the right), the 556 has a lot of drift (although it looks like it might eventually stabilize) and, as well, produces several spurious signals ... probably robbing power from the main tone. 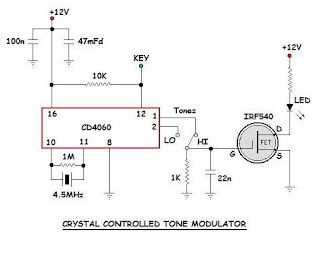 The crystal-controlled signal is rock solid and doesn't appear to generate any parasitic signals in the process. 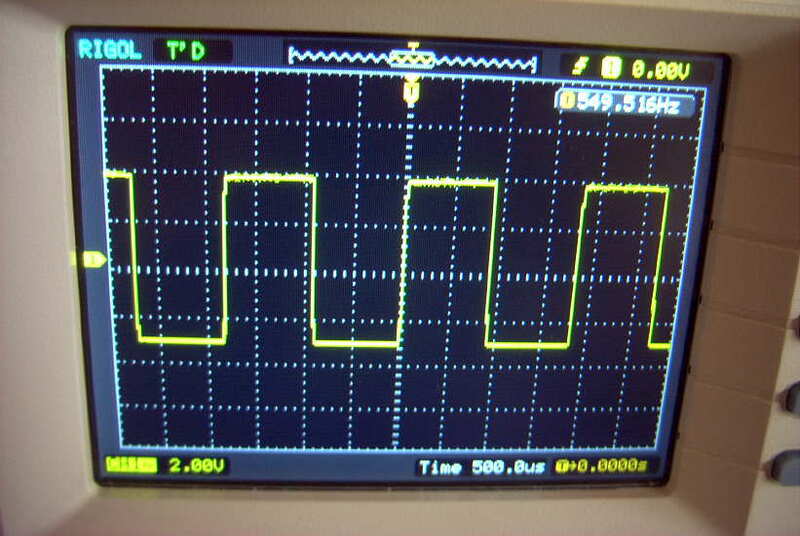 The trace below the crystal signal is unrelated to the oscillator. When I first wired the unit up, I found an unstable low frequency oscillation from the 4060 during key-up conditions, due no doubt, to the lengthy leads inside the box. 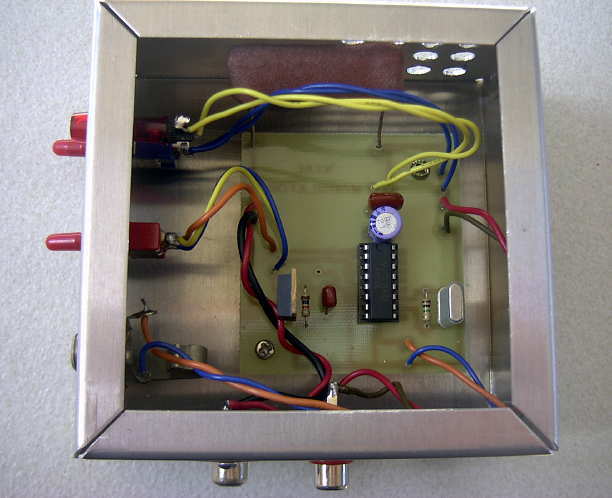 This was cured by adding a pull-up resistor to the keying line as shown in the final schematic below. 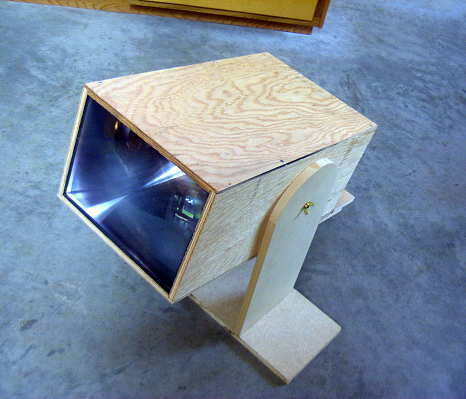 Now it's on to building another fresnel-lens receiver box which will be needed for any field work here on the island. I spent a couple of hours again this weekend playing with the N1MM contest logging software and getting back into the contesting groove. My new K1EL USB interface continues to work flawlessly, even on my ancient XP laptop ... gone are the occasional keying stutters produced when previously keying from the serial port. N1MM is one of the most widely-used contest loggers and is freely available for download here. I still run the older 'Classic' version as I don't think my laptop could handle the newer 'N1MM +' edition ... I'll upgrade when I get a newer contesting laptop. Both the Colorado and the Tennessee State QSO Parties were held this weekend, providing me another round of CW contest practice. Both activities are pretty low-key affairs when it comes to contesting but hey, every bit of practice helps. I found surprisingly little action in the CO Party, making just 18 contacts ... 12 on 20m CW and 6 on 40m, with 17 sections worked. There seemed to be more activity from TN amateurs though, with 38 QSO's in 33 sections, 28 on 20m and 10 on 40m. All contacts were made on CW. All of the 40m contacts were made several hours before local sunset here, surprising the heck out of me that the W4's could even hear me in broad daylight ... the stations worked must have very quiet locations. 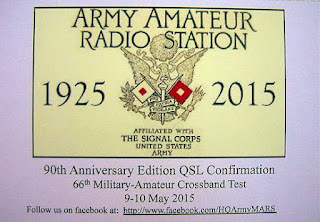 The state QSO parties are a good way to enjoy a short round of contesting without blowing an entire weekend, which I don't think I would really like to endure, and there seems to be at least one or two of them each weekend ... an easy way to ease into contesting or to keep up your on-the-fly contest keyboarding skills. With all commentary periods for the FCC's 'Notice of Proposed Rulemaking' (Docket 15-99) now closed, it appears that one of the last comments to be filed may contain the most powerful arguments in favor of swift implementation. In its extremely detailed 42-paged submission, the ARRL states, in no uncertain terms, the reasons why access to both the 2200m LF band and the 630m MF band should not be held back and that service rules should be 'finalized'. Indeed the powerful arguments stated in favor of implementation should go a long way in making this happen sooner rather than later. In addition, the ARRL had harsh words regarding the FCC's attempt to legitimize the growing number of fish-net beacons in the 160m band, and pulled no punches regarding their position in this matter. "There is no indication that these buoys are compatible with other uses in the band, no track record of interference avoidance or resolution, and certainly no indication that the current operators can be relied on for compliance with the Commission’s rules." "The Commission is urged to avoid enacting rules that it has no effective ability or intention to enforce. That fishing vessels have, with impunity, illegally deployed radio buoys in this band on a widespread basis (whether or not due to misrepresentations of the importers and retailers of these devices or due to a disregard of the Commission’s rules generally) without even nominal enforcement actions by the Commission, provides no basis for assuming that there will be compliance with any deployment limitations (including geographic deployment restrictions) on these buoys going forward. Nor is there any basis for the assumption that there will be any enforcement action taken with respect to continued illegal operation of the buoys if and when interference is caused. Spectrum planning by the Commission in this context has to be based on ex ante determinations of compatibility rather than mere assumptions, especially where the record indicates such a low level of historical compliance." A summary of the comments can be read here in the ARRL News while all comments filed for the NPRM be found here temporarily, while the FCC site is down for maintenance. 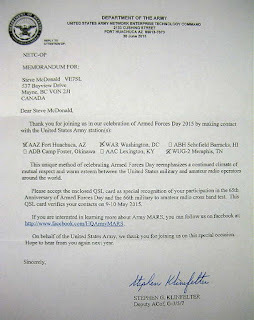 Yesterday's mail brought an official - looking envelope from the U.S. Army! It contained a very nice letter from Fort Huachuca, Arizona, thanking me for participating in the '66th Military-Amateur Crossband Test' as well as three QSL's for the Army-affiliated contacts that I had made back in May. 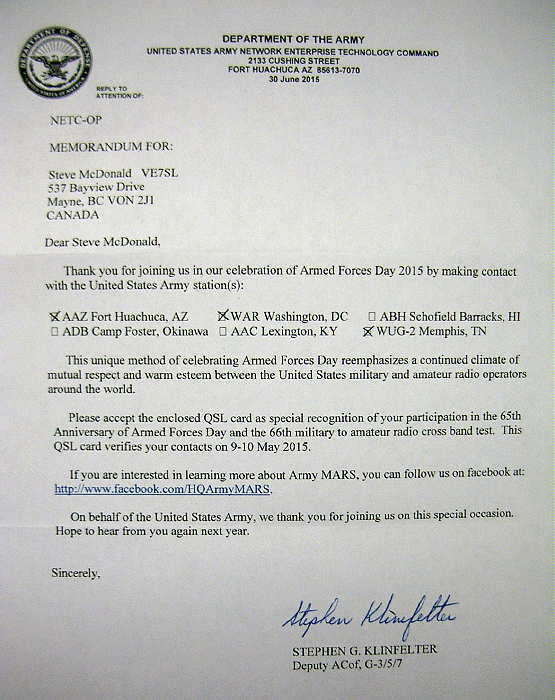 During the activity, I was able to work Army stations AAZ (AZ), WAR (Pentagon), WUG-2 (TN) ... all on 20m via the crossband mode as the military stations transmitted outside of the band. 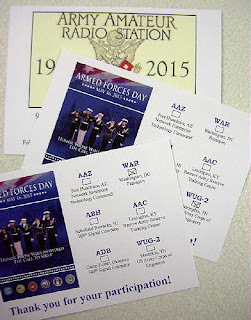 In addition to these three, two Navy stations were worked ... NWVC (IN) and NPD (TN) but it appears that 'Army' has beaten 'Navy' ... at least when it comes to QSL'ing!